What’s a human called who generally lives from a place of thankfulness, regardless of varying circumstances? A gratidude. Gratitude shows up in all sorts of places and ways. 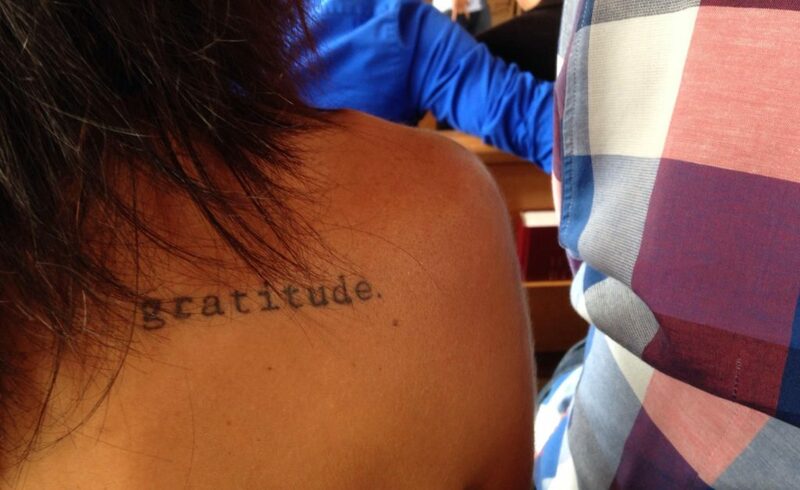 I snapped this photo of a woman’s beautiful shoulder in church. As I listened from my pew with a view, I couldn’t help but feel The Word a little more. “Traveling recently to Jamaica, I noticed a custom that’s also practiced in Mexico. When passing by a local, especially in the service industry, the other locals stop in their tracks and put their open hand to their heart. I find this to be quite beautiful. I may start doing this to get it going in the States. Join me?